The European Commission proposal to harmonize fair remuneration in Member States in EC “on copyright in the Digital Single Market” included the proposal to harmonize a right to contract reversion. Fair remuneration is an ambiguous concept for economists: some EC documents imply the policy is required for efficiency purposes, and in others, purely for equity reasons. Copyright to an extent attempts to deal with both and also at times confuses the two. This article tries to disentangle these issues. Research commissioned by the European Union (the “EU”) prior to the proposal concentrated on the legal aspects rather than on the impact on markets. It would have benefitted from recent work in law and economics and in economics on reversionary rights as well as to a well-established body of research in cultural economics on labour markets of authors and performers in the cultural and media industries. That work shows both the variety of influences on motivation, incentives and contracts for creators, as well as exposing the difficulties of empirical research in this area. 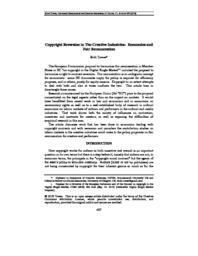 The article discusses work that has been done in economics dealing with copyright contracts and with reversion and considers the contribution studies on labour markets in the creative industries could make to the policy proposals on fair remuneration for creators and performers.